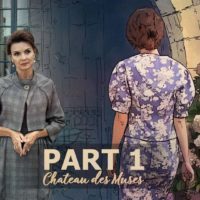 The Chateau des Muses is an elite boarding school for young and promising ladies determined to not only acquire an outstanding secular education but to become genuine Muses who would inspire bright minds to create their masterpieces or make discoveries that would forever change the course of human history. Every Muse is intended to be the embodiment of art itself, an unbounded source of creative energy and sensual exuberance. The institution is managed by headmistress Patricia, an experienced and rigorous teacher, mentor, and Muse herself. Her right hand is professor Lucas, an outstanding artist who dedicated himself to teaching the students of the Chateau everything he knows about fine arts. But is everything as innocent and noble as it sounds? Inspiration goes hand in hand with passion, and love is often accompanied by lust. By showing their students the vast magnificence of art and all the aspects of sensual inspiration, the Chateau is playing a dangerous game: who knows what hidden desires and fantasies have the girls been harboring all along?